Generally a hotel concierge provides different types of services to his or her guest to ensure guest’s satisfaction. A concierge is an important member of hotel’s front office department and he reports directly to front office manager. 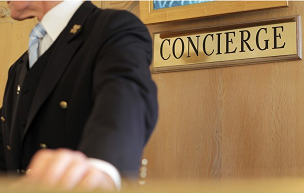 A bellboy or bell person or assistant concierge or doorman reports to concierge. Generally a concierge handles everything related to guest paging, guest’s baggage and packaging, service from bell boy or doorman or porter, guest’s tour and travel related services etc. Since, in today’s highly competitive hospitality world, meeting guest’s demands and satisfaction is very important, so a work of a concierge who looks after meeting various guest’s request, is vital for every hotel. Before reading rest of the tutorial, we highly recommend you all to read our previous article, Concierge service in hotel. Either a guest (or the receptionist) will call to ask you to pick up guest luggage as they are checking out. At this point, confirm the room number and query on how many pieces of luggage they have, so that you can decide to take a trolley if required. You also need to know if the guests would like their luggage stored, put into their car etc. Log the information in the logbook; stating the time, pieces of luggage, room number, and Bellboy allocated to the task of collecting the luggage. If the guest requests luggage to be picked up, the Bellboy must inform other bellboys/doorman so that any potential walkouts can be identified. Take a trolley if necessary, and make your way up to the guest’s room using the service elevators. At the guest’s room knock on the door and announce “Concierge”. If the guests are in their room say “Good Morning Mr. Smith, may I take your luggage and store it in your car?” etc. Check with the guests that all their luggage has been collected before they leave the hotel. Treat the luggage very carefully. Linger in the room or Lobby waiting for a tip or ask for a tip. Leave luggage unattended in the lobby or anywhere else. The group movement sheet will indicate the time at which the luggage collection will start and the time allocation for the completion of the task. The sheet will also indicate if the guests are leaving their luggage inside or outside their rooms. Instruct the bellboys as to which rooms they will bring down; this will involve printing numerous copies of the rooming list and highlighting each bellboy allocated rooms. As the bags are brought down, the Asst. Concierge will need to check off the names on the master rooming list. Every Bellboy will need to take a trolley if possible, this will increase productivity. Using the service elevator the bellboys must go to their respective floors and start collecting bags. At the guest’s room knock on the door and announce “Concierge”. If the guests are in their room say, “Good Morning Mr. Smith, may I collect your luggage” etc. Always leave the trolley outside the room. If the guest is not in the room, enter the room, move the luggage onto the trolley and quickly glance around the room to make sure you have not left anything behind. If the group is leaving their bags outside the rooms, it will be important to ensure that the room is checked off, and if a room is on your list that does not have bags in front of it, use normal procedure and knock on the door announcing “Concierge”. If the guest is not in the room let yourself in and check for luggage. Place it on the trolley if it’s in the room, if the room is empty place a ‘?’ beside the room number and discuss with the Asst. Concierge once downstairs. Transport the luggage back to the lobby and place with the other guest’s luggage, and have the Asst. Concierge check the luggage off on the group master. If the group are going out and are coming back to pick up the luggage, place it in the storage room, and chain it together and label clearly the groups name. If the group is leaving, have the tour leader check the luggage, and then load it onto the bus.